(Sept. 21, 2017) – St. Louis Blues President of Hockey Operations and General Manager Doug Armstrong announced today the club has named hall of famer and nine-time Stanley Cup champion Larry Robinson Senior Consultant to Hockey Operations. Armstrong will be available to the media following Blues practice today at Scottrade Center, while Robinson will be available during the first intermission when the Blues host the Dallas Stars on Saturday, at 7 p.m., at Scottrade Center. Robinson is a highly experienced and accomplished former NHL defenseman, coach, and executive. During his illustrious career in hockey, he has won nine Stanley Cups and participated in 13 Stanley Cup Finals. "It's never an easy decision, and it's not the only decision, but there was definitely a shake-up needed. Especially after being up 3-0 and then losing four straight to a team that we should have never lost to. You always look to your leaders and we certainly look to all our top players, not just Joe and not just Patrick, but all of our top players as a whole and when you have one goal, two assists and collectively a minus-29 in your final four games, you have to start looking to shake things up a little bit." -San Jose Sharks associate coach Larry Robinson on removing the 'C' and 'A' from Thornton and Marleau. Robinson appeared on TSN690 today in Montreal and Fear The Fin has more from Robinson. I was also curious about how his sense of the game has changed since he played in the 1970s and now views it as a coach in 2013. Then he talked of conversations he had with former NHL defenseman Vladimir Malakhov. Robinson has been coaching in the NHL for almost 20 years now. I asked him last summer how has his coaching philosophy changed over that time ? “I was a little more of a defensive-minded coach. And I think in a way I’m still the same, I still think that good defense leads to offense – but I think you have to be a little more offensive minded now with the way the game is going. After playing 1,200 games for the Habs, making the Hall of Fame, and having his No. 19 hoisted to the rafters, Robinson considered coming full circle. He was very interested in the head coaching job last summer, but the 61-year-old couldn’t get together with general manager Marc Bergevin, who eventually hired Michel Therien. After being Devils coach Peter DeBoer’s assistant last season as New Jersey reached the Stanley Cup final, Robinson took a job in San Jose so he and his wife could be closer to his daughter and their twin, seven-year-old grandsons who live in Los Angeles. But the idea of taking a crack at the Habs job was percolating in his head. “I kind of thought of working there (in Montreal) this year, but I guess the writing was on the wall … it wasn’t going to happen. I was supposed to meet with Bergevin (to interview) but we had a big storm and a flood in Florida and I wanted to make sure everything was fine at the farm. I wanted to make sure the horses and my machinery weren’t going to float away,” said Robinson. “Then he got word I was taking other offers (Sharks general manager Doug Wilson had called out of the blue to see about Robinson moving to San Jose). He did what he had to do and I did what I had to do. SAN JOSE – San Jose Sharks Executive Vice President and General Manager Doug Wilson and Head Coach Todd McLellan announced today that longtime NHL player and head coach Larry Robinson has been named associate coach. Robinson served as head coach for the Los Angeles Kings from 1995-99 and for the New Jersey Devils from 1999-2002, and in 2005-06, including leading the team to a Stanley Cup Championship in 2000 and the Stanley Cup Final in 2001, before falling to the Colorado Avalanche in seven games. Robinson has also had stints as an assistant coach with New Jersey, including their 1995 and 2003 Stanley Cup Championship seasons and last season when the team advanced to the Stanley Cup Final against the Los Angeles Kings, falling in six games. For nearly an hour on Sunday from his home in Florida, Canadiens Hall of Famer Larry Robinson spoke to Hockey Inside/Out’s Dave Stubbs about his latest brush with a coaching position with his former team. Robinson took the high road, but there’s no question he would have enjoyed the chance to work with some of the Habs’ young blue line prospects. Canadiens general manager Marc Bergevin rounded out his club’s coaching staff last week, naming former Habs defenceman Jean-Jacques Daigneault as the second bench assistant for head coach Michel Therrien. Daigneault joins Gerard Gallant, with Clément Jodoin contributing perspective from the press gallery and Pierre Groulx continuing his work as goaltending coach. There had been considerable talk in the Canadiens universe since Bergevin’s May 2 hiring that Robinson, at that time an assistant coach for the New Jersey Devils, would be an ideal choice to nurture a young Montreal defence corps. Ultimately, the composition of the coaching staff was left up to Therrien, and last Friday he decided on Daigneault as the final member of his staff. There is no bitterness in Robinson, who a few times in the past half-dozen years has been in a contractual position to return to the Canadiens in a coaching capacity. Devils assistant coach and 2000 Cup-winning head coach Larry Robinson vehemently ripped a report suggesting he is interested in joining the new Montreal regime, saying that comments attributed to an agent, whom he called a friend, were five years old and that there has been no such contact or interest. If you want to review the report from the agent, friend, do so here. Are The Devils About To Lose Larry Robinson To Montreal? Former Montreal Canadiens great Larry Robinson wouldn’t mind joining the Habs as an assistant coach, his agent said Wednesday. Robinson, who currently works for the New Jersey Devils, would be a good fit with the Canadiens, Don Cape told TVA Sports. But Montreal would need to ask permission to talk to Robinson and that wouldn’t be granted until after the Devils season comes to an end. Larry Robinson understands more than most that sometimes the difference between victory and defeat has everything to do with the transition from offense to defense and from defense to offense. For 21 years, Robinson played professional hockey at the highest level and was inducted into the National Hockey League Hall of Fame in 1995. Six times he lifted the Stanley Cup. He’s now playing a lot of polo. On Sunday, he and Citizens First teammates Joy Rodak, Antonio Campos and Jamie Mirikitani lifted The Villages Health System Cup after defeating Preferred Care, 10-6, in the championship match of the 6-goal tournament at The Villages Polo Club…. Hall of Famer Larry Robinson will not return to the Devils’ bench as assistant coach next season, GM Lou Lamoriello told The Post yesterday. Lamoriello said Robinson will revert to his previous post as a special assignment coach. The National Hockey League can’t protect players from headshots and dangerous hits from behind, but it is determined to have games start on time. The Canadiens have been fined an undisclosed amount after the start of last Monday’s game against Ottawa was delayed about 10 minutes because the ceremony to retire Larry Robinson’s No. 19 ran longer than planned. MARVELVILLE—The road from this hamlet south of Ottawa to Montreal goes east and north to Hwy. 417. For Larry Robinson, it was paved with the work ethic of a farmer’s son. Broke after his first year in pro hockey, and with a young wife and son, Robinson worked on the paving crew—7 a.m.-7 p.m.—on the 417 between Russell and Maxville in the summer of 1972. Robinson made just $7,500 the previous winter playing for the Canadiens’ AHL farm team in Halifax. With wife Jeannette and son Jeffrey, money was stretched thin, especially when the team went on a long playoff run and won the Calder Cup. added 8:56am, Habs Inside/Out has some Robinson memories you may be interested in. Some nice postcard pictures of Robinson and Red Fisher looks at Robinson. If the Montreal Canadiens keep retiring the numbers of everyone who deserves it, they’ll look more like a football team than a hockey team in a few years. The Canadiens, who do these ceremonies far better than anyone else in the NHL (are you watching, Maple Leafs?) are set to retire their 12th number Monday night when Larry Robinson’s No. 19 is raised to the rafters of the Bell Centre. That will be followed by Bob Gainey’s No. 23 in February with it all but certain the Canadiens will retire Patrick Roy’s No. 33 next season when they celebrate their 100th anniversary. Montreal Canadiens fans had waited a long time to give Larry Robinson the ovation he received Monday night, and they weren’t going to sit down until they were good and ready. Robinson joined 12 other Canadiens legends when his No. 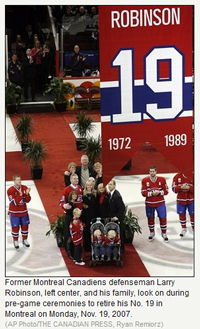 19 was retired and raised to the Bell Centre rafters before Montreal’s game against the Ottawa Senators. Robinson received an ovation of several minutes when he was first introduced to the crowd, and he tried sitting down to get the fans to stop. But they refused, continuing for several more minutes despite Robinson’s repeated attempts to get them to sit down.